Your ultimate ski or snowboard experience starts here! Imagine being dropped at the top of an untouched mountain; being left with just snow and silence after your pilot departs. You, the mountain, and endless fresh tracks – that’s what heliskiing is all about. It’s an unforgettable way to celebrate a special occasion and a brilliant ski or snowboard adventure to share with friends. Heliskiing involves booking a ski guide along with a helicopter. Guides charge a set rate of 340€ for the day for 1-4pers (+50€ per additional person). Helicopters charge per ‘rotation’, or drop-off. A helicopter’s costs are set, so you’ll benefit from filling it and therefore reducing the price per head. French environmental protection laws prevent heliskiing operators from working outside of ski resorts in France due to the noise they cause disturbing wild fauna. Heliskiing in France is therefore only legal if you’re dropped to the top of a chairlift. In Italy and Switzerland heliskiing is legal, though new restrictions will be put into place soon. 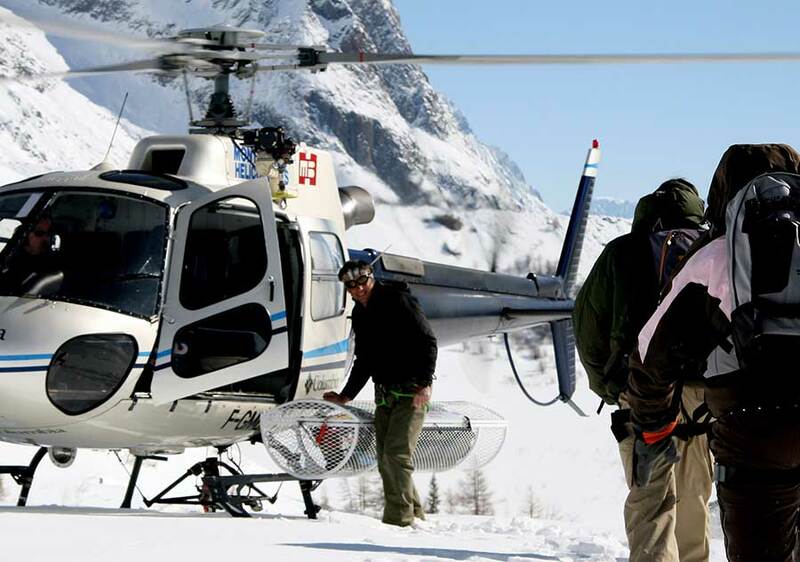 Heliskiing is ideal for experienced off-piste skiers seeking a new thrill, or who are celebrating a special occasion. Participants are required to have a good level of confidence skiing off-piste and over varied terrain. We ideally recommend that you spend a day skiing off piste in the Grand Massif with your guide before he takes you heliskiing, so that he can choose a heliski descent to fit your level of ability. High mountain guide : 350€ per day (for 1-4pers, +50€ per additional participant), to be paid in advance to ZigZag. Helicopter prices 2017 : approximately 750€ per helidrop (space for 5pers +guide), to be paid to the service provider on location. Please note that helicopter prices are fixed for 1-5pers so it is worth filling all 5 spaces in order to reduce the individual cost per person. Accommodation at Valgrisenche : approximately 80€/pers, to be paid directly to the hotel. The next “place to heliski” where you may be the only one to ski a powder field all winter long… A place where helicopter access is the only way to reach glacial peaks untouched and often unexplored. Real, raw and utterly beautiful – Kyrgyzstan is the pinnacle of your powder skiing dreams, with an eastern block cultural kick to boot. 10 hours helicopter flight are included in this package, including 4 hours transfer time (2hrs each way from Manas airport to Karakol base hotel) and 6 hours helicopter time for heliskiing over 3 days. *NB : 1-2 days are held in for reserve in case of bad weather. Participants are provided with lift passes for the Karakol ski area for days when helicopter flight isn’t possible. The heliski day we spent with Christophe was a-ma-zing!! He was everything a guide should be – professional, entertaining, organised, inspiring… we’ve each made the comment individually that we’ve thoroughly enjoyed our time with him. As for the skiing itself, well, we couldn’t wipe the smiles off our faces for days afterwards, and we’re all desperately planning our next heliski trip with you. Be warned, we’re coming back!